Added Storage Capacity – MRP has added an additional storage area on each side of the new design. The water heater and remote C02 tank have also been relocated to rear storage increasing room in kitchen. We have also added a storage room just outside restrooms for additional storage capacity. Structural Engineering – MRP has redesigned the steel structure to reduce the amount of structural steel required further reducing cost of the building. HVAC and Ventilation – MRP has worked with the hood manufacturer and HVAC unit manufacturer to develop a new state of the art mechanical design that eliminates make up air and reduces moisture in the restaurant. This creates a more comfortable dining area and kitchen. Roofing Improvements – MRP has worked with Duro-Last, the manufacturer that supplies the roof material, to change roofing specifications to a thicker material (50 mil) and add further details to improve roofing installation and reduce roof leaks. Walk pads have also been added to improve durability of roof material. Additional details have been added to minimize potential for leaks. Equipment Connections- MRP has collaborated with all three equipment suppliers to better detail equipment connections including electrical, mechanical and plumbing. This results in accurate construction installation of equipment rough-in and final connections which saves time and money with no change orders from the GC. MRP has also developed complete kitchen equipment drawings based on the standard equipment package as defined by Zaxby’s. Seating Layout – MRP has also been working with the seating supplier to coordinate layout of all short walls in seating areas. We have also modified the design to include most current handicap requirements for restaurant seating. Better Drawings – MRP has worked with several of the most experienced General Contractors having built hundreds of Zaxby’s stores. 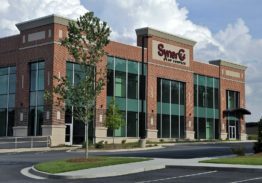 Based on discussions with the contractors and modifications to many of the details previously used we have created a far superior building requiring less maintenance. We have incorporated many new energy efficient standards and added features such as wall pass through drains for operational ease in clean-up. 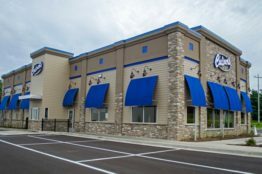 A licensee in Columbus Georgia opened a new Zaxby’s with the MRP design and is experiencing utility cost savings of $700 per month over stores built by the previous design just a few years ago. A licensee in Lilington, North Carlolina stated her construction bids were over $100,000 less on her new MRP design versus a previously designed Zaxby’s built less than three years ago. A licensee in Saint Augustine, Florida has been operating an MRP designed Zaxby’s for over a year and he says the kitchen is far more comfortable than several other Zaxby’s he operates built by the previous design. He also said his utility costs are equal to or less than his older stores. If you have any questions regarding MRP Design Group contact Ken Dalton at 770-917-9172 ext.104.